Wednesday Wrap: Clearaudio Concept, Sky Buy & Keep, B&O, Flexson and more | What Hi-Fi? Clearaudio has announced that its Award-winning Concept turntable is now available in a new Wood finish. 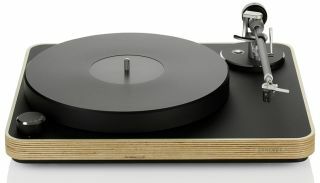 The addition of the Wood finish takes the number of Concept variants to four, with the two regular-finish editions - Concept MC with moving coil cartridge and Concept MM with moving magnet - joined by the Concept Wood with both cartridge variations and a body made from multi-layered Baltic birch wood. All versions also receive a tonearm upgrade, to Clearaudio’s Verify Direct Wire Plus, as well as adjustable and lockable rubber-tipped feet. Multi-room audio manufacturer Raumfeld has announced it will be launching the Expand wireless hub in the UK. The Expand creates its own mesh network for the Raumfeld system. This, it is claimed, provides a more stable connection for wireless streaming than regular home broadband. The Expand hub can manage up to 200,000 songs and has a USB port for connecting storage devices. A Raumfeld system can be controlled via the accompanying iOS and Android app. The Expand is available now from Raumfeld’s website for £49. Sky has announced that its Buy & Keep service, which lets you pay for a movie in the Sky Store to watch instantly and then receive a DVD copy to keep, is now available to everyone in the UK and Ireland. Both Sky customers, and anyone visiting skystore.com or Sky Store app can take advantage of the service, and download a movie to a mobile, tablet or laptop. Non-Sky TV customers in the UK aren’t limited to watching on mobile devices; content can be watched on a TV via Now TV, Roku or YouView. Customers in Ireland, meanwhile, can watch on a TV through a Roku box. We reported last week that new UK-based audio manufacturer Trinity had announced three pairs of in-ear headphones on Kickstarter. At the time, just over £50,000 was raised. In the week since, that has gone up to close to £70,000, with 11 days still to go. The headphones have been created with sound and build quality as top priorities, and range in price from £30 to £90. You can pre-order a pair on the Kickstarter page here. Bang & Olufsen has announced the BeoLab 5 speaker will be the latest addition to the company’s Love Affair Collection, and receive a rose gold makeover. The Love Affair Collection has been designed to celebrate 90 years in the AV business for B&O, and the range already includes some iconic products, such as the BeoVision Avant TV, BeoLab 18 and BeoVision 11. The BeoLab 5 Love Affair speaker is available now for £7895. Flexson has also announced an addition of its own, in the form of a bespoke floor stand for the Blue Note edition of the Sonos Play:1 speaker. The Blue Note edition of the Sonos:1 features a “vertical fade finish from cary navy to cerulean blue”, and the stand has been colour matched to complement it. As with other Flexson products for Sonos, the Play:1 speaker can be attached with relative ease, and puts the speaker at the “ideal listening height”. It also incorporates an efficient cable management system. Only 100 of the Flexson stands will be made. They’re due to go on sale from May for £70 and can be pre-ordered now from Flexson’s website.